The sellout is complete: WorldNetDaily cares more about ad revenue than it does about principles. We knew this already -- despite Joseph Farah's history of attacking Google as an "immoral" company that "may not be able to discern right from wrong," WND has been using Google AdSense for much of its advertising since 2009 -- but it has come into stark relief with a new tussle between WND and Google. In response, WND is preemptively blocking Google ads in content in which that phrase appears in past and current stories, including this one. Other ad providers have agreed to step in and fill the gap. That's right -- rather than fight the power, WND has acquiesced by trying to keep the offending words from jeopardizing precious Google ad space. And yet WND still gets it wrong -- there are still Google ad spaces on the page this article resides on. As of this writing, the vertical ad strip on the left side of the article and a horizontal ad strip at the end of the article are still both Google AdSense spaces, as are two square ad boxes in the right-side strip and the middle square ad box at the bottom of the page. The horizontal ad strip at the top of the page belongs to a company called Turn, while the left bottom square space belongs to Criteo and the right bottom space belongs to Evidon/Audience Science. The top right square ad is operated through SiteScout, while another right-hand ad box is operated through AppNexus. It all began two years ago when WND made the decision to begin tracking what appeared to be a rise in unprovoked black on non-black violence. Through the reporting, WND first alerted the nation to “the knockout game,” in which perpetrators seek to render unconscious innocent and unsuspecting victims usually with a single blow to the head. We reported on coordinated riots and seemingly spontaneous uprisings occurring in major cities and small towns from coast to coast. As a result of the reporting, mayors and police departments around the country began responding. Our reporting was condemned by racialists quick to excuse or cover up bad behavior in minority communities and extolled by many, including black scholar Thomas Sowell, who strongly and repeatedly endorsed a groundbreaking book WND published by Colin Flaherty called “White Girl Bleed A Lot,” which includes much of the reporting he did for WND. Google is clearly assigning motives to our reporting on the basis of the linking of two words – black mobs. Euphemisms for two perfectly accurate words must now be found because Google has determined that the linking of these two words is hate speech. When one of the most powerful media companies in the world starts banning words and phrases and imposing its speech police standards on all those it does business with, we are headed down a dangerous, Orwellian slippery slope. The term “black mobs” as used in WND is not a pejorative term. It is not hate speech. In fact, it is the reporting of facts – facts that have been substantiated and reported by many other news sources since WND began reporting on the trend two years ago. WND Books’ “White Girl Bleed A Lot” is carried in bookstores across the nation and on Amazon.com. What’s next – burning the books? As we've amply documented, the only crimes WND consistently reports on involve "black mobs." If there wasn't a racial or pejorative motive behind it, why has Flaherty been so desperate to push the issue that he has included non-blacks and animals in the "black mobs" he writes about? 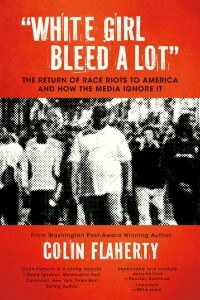 Why doesn't WND give other crimes the kind of blanket coverage it has afforded Flaherty and his "black mob" obsession? Farah doesn't explain. As the WND "news" article on this subject notes, the term "black mobs" has appeared in "more than 670 WND reports." Can WND claim it has given that kind of coverage in the past two years to any other subject, let alone any other crime? Farah might claim he's engaging in "the reporting of facts," but those facts are cherry-picked and taken out of context for no other apparent reason than to instill an irrational fear of black people in WND's predominately white audience. In both the news article and Farah's column, the endorsement of Flaherty's race-baiting by "celebrated black scholar Thomas Sowell" is presented as evidence that this is somehow not race-baiting. That appeal to authority is a logical fallacy that only serves to demonstrate how ethically and morally barren Flaherty's race-baiting crusade is. But there’s an issue here that should be noted by all who value free expression and honest journalism that some may find offensive. Google’s policy attempts to censor words and phrases that are truthful and accurate from First Amendment-protected media on the basis of political correctness and faulty algorithmic methodology. In journalism, a craft I have practiced for more than 35 year at all levels and in all media as a reporter, top editor of major market daily newspapers, on the radio, in television and, more recently, as an Internet pioneer who created the first independent news source, there is great value in connecting the dots between hundreds of seemingly isolated incidents. That’s what we did. It was seen as a public service by many – including me. We cannot and should not be forced to sanitize our compelling reporting on a subject of national importance because it is labeled thoughtlessly and falsely as “hate speech.” WND’s reporting on this phenomenon is neither motivated by hatred nor does it foster hatred. Ironically, the real hate speech and hate actions are what we are reporting on, what we are exposing. If Google takes this censorious action, it would be an act that would have a chilling effect not only on free speech but on responsible reporting about a crime wave affecting the entire nation. Funny, the only "censorious actions" we've seen have all come from WND, which has kept its readers ignorant of the fact that its birther crusade has been discredited and give no meaningful recourse to those targeted by the lies WND publishes on a depressingly regular basis. WND's race-baiting has been called out, and Farah needs the Google ad revenue too much to do anything other than rant impotently at getting caught.